This special Colca Canyon-Tour includes a journey through the Altiplano to the kingdom of the Condors, starting from the city of Puno. During this trip you will be able to see great Andean scenery and gorgeous views of Arequipa’s volcanoes, adorned by Alpacas, Vicuñas and the majestic Condor. 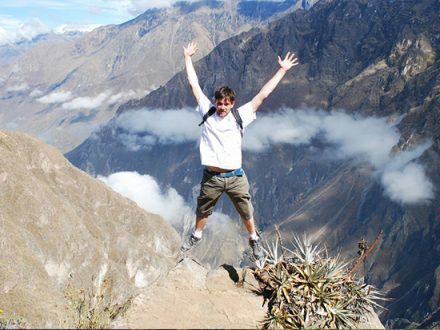 You will visit the famous lookout point “Cruz del Condor” in the Colca Canyon, an observation platform from which you have the possibility to see the majestic flight of the Andean Condor in its natural habitat. 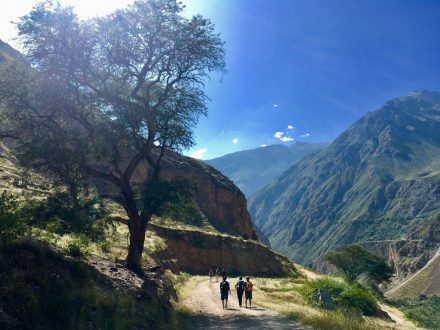 On our journey, we include the visit of some of the small communities located on the route, as well as a visit to the greatest Hot Springs of Peru – a fantastic natural place where you can relax after exploring the great Colca Canyon. At the first day, your adventure journey begins at 06:00 am when you will be picked up from your hotel in Puno. We will board our tour bus and hit the road to the north-west, leaving behind us the gorgeous scenery of the Lake Titicaca. Along the paved road, we will see many small towns as well as the beautiful lagoon Lagunillas, where we can explore trout farms and observe Andean flamingos among many Andean birds. Following an ascending road, we will then reach the Viscachani. We have a short break and stretch our legs, use the bathroom if needed and drink a typical coca tea or coffee at the local restaurant. 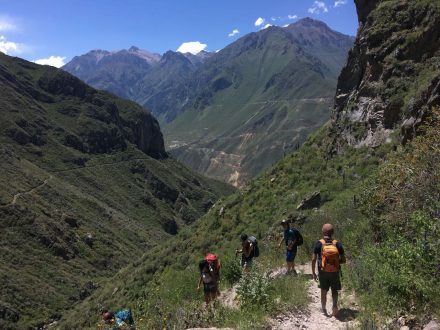 Afterward, we will continue ascending a small road until we reach the highest point of our trip, the lookout point of the Andes (4800 m/15,748 ft). At the very top, we will get off of the bus for a few minutes and enjoy the stunning landscape with the great volcanoes including Mismi, Misti, Chachani, Sabancaya (active) and Ampato. 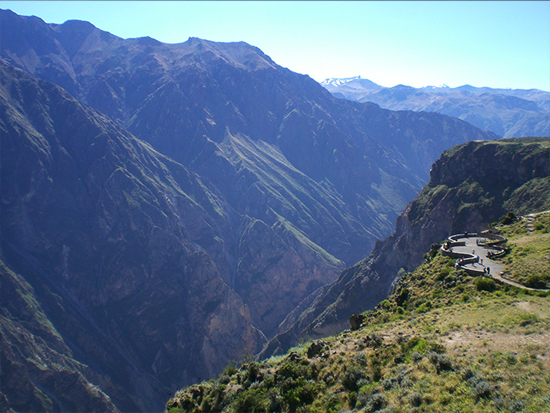 Later on, we will drive downhill to the main town of the Colca Canyon: Chivay (3600 m/ 11.811 ft). We will stop at the main square of Chivay and then bring you to your hotel. At 03:00 pm, we will coincide with our travel mates, who started the Colca Canyon Classic Tour from Arequipa. Afterwards, we bring you to the hotel Mamayachi where you have some time to relax before joining a 30-minutes-walk to the Hot Springs. Here you can enjoy the warm natural waters (35°C/ 95ºF) in a nice outdoor surrounding of the huge mountains, the river, and even some local animals. After sunset, we return to the hotel and have dinner. The second day of our adventure, we will have breakfast very early in the morning and leave to the famous “Cruz del Condor”. Arriving there, we have plenty of time to enjoy the great view of the deep canyon and (if the weather permits) of the majestic Condor in its natural habitat. After some time, our guide will take you for a short walk near the Canyon (approx. 1 hour). On our way back to Chivay we’re going to visit the traditional village of Pinchollo and the “Antahuilque viewpoint” where we can gaze at the wonderful 1500-year-old terraces constructed by the Collaguas, an ancient culture before the Inca’s time. We will also make a small stop at the look-out point of “Choquetico” with its hanging tombs. Then, we continue our trip to the small Andean community Maca and the village of Yanque with the most beautiful church in the whole valley. We will stop for Lunch in Chivay before taking the way back to Arequipa. Arriving there around 05:00 pm, you will be transferred to your hotel. Note: Please do not give candies or lollies to the kids that you might meet on the road or the kids who take care of the llamas and alpacas. They really appreciate oranges and other fruits as it is impossible to grow these in the altitude. As well, it will contribute to their (dental) health and their environment. Send a deposit of 60% of the total price of your tour. (The remainder of your balance will be due upon your arrival in Cusco or Puno.) Payment may be made via *Western Union, PayPal, ABN AMRO Bank in Holland or securely and directly through our website by choosing your desired tour and clicking on the BOOK NOW button. Price US$ 160 per person, based on two people. A single person pays +US$ 40. Children under 12 years get a discount of 30% on the Tour. Hotel Pozo del Cielo: +US$ 20 per person. Hotel Casa Andina: +US$ 25 per person. Hotel Colca Lodge: +US$ 80 per person.